The Rocky Patel Fifteenth Anniversary was released to celebrate Rocky Patel’s 15 years in the cigar business. Starting as the Indian Tabac Cigar Company, Rocky Patel Premium Cigars has come to prove itself in the ever growing cigar industry. The Fifteenth Anniversary series is rolled in Nicaragua at Tabacalera Villa Cuba, which Patel only partially owns. The filler tobacco for these cigars is grown on a farm dedicated only to this brand and blend. The first thing I noticed about the Rocky Patel Fifteenth Anniversary was the impressive steel colored double bands the cigar bore. The 15th Anniversary was box pressed with a wrapper that gave way to an elegant dark oily sheen. The cap was a nice pointed tip and the pre-light smell gave hints of oak and bourbon with the cold draw being completely different, showing notes of cherry and vanilla. The first third of my Rocky Patel Fifteenth Anniversary produced a wonderfully sweet aroma with loads of gray smoke. The first third danced between medium and full bodied with an uneven burn. The taste was a very defined coffee with touches of light spice and chocolate. Into the second third of the cigar I had to touch the burn up however once fixed it wasn’t an issue for the remainder of the smoking experience. 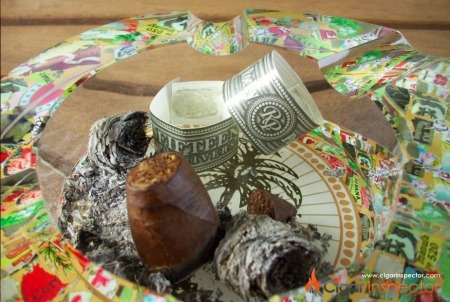 The cigar moved completely into the full body category with coffee notes becoming heavier and more intense. The sweetness experienced in the first third was replaced by a charcoal/burnt flavor that tended to be bitter at times. The final third of the Rocky Patel Fifteenth Anniversary was spicy and heavy with dark coffee notes. The ash was a beautiful wavy gray and the body remained full. The finish on the cigar took an interesting turn to nutty and leathery characters that made for a satisfying finale. 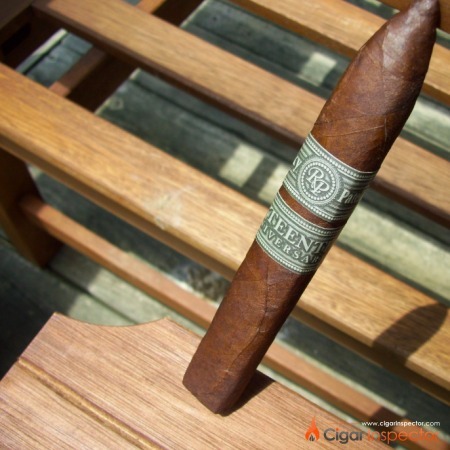 My final thoughts on the Rocky Patel Fifteenth Anniversary are respectable. The cigar gave way to a perfect draw the entire time, was slow burning, and produced a lot of full bodied voluminous smoke. The flavors/taste had minor changes throughout with the crescendo of spice and coffee from beginning to end. Overall I think Rocky Patel cigars are certainly on the right track with most of their cigar lines. I recommend giving this one a shot if you’re looking for an intense full body, coffee smoking experience. Overall Experience score: 7 pts. Nice review Kaleehb. Definitely a go to when I’m in the mood for NC stick. Look forward to your next review.